I don't normally share much personal information about myself or my family, but today I want to share with you a little bit about my oldest son. 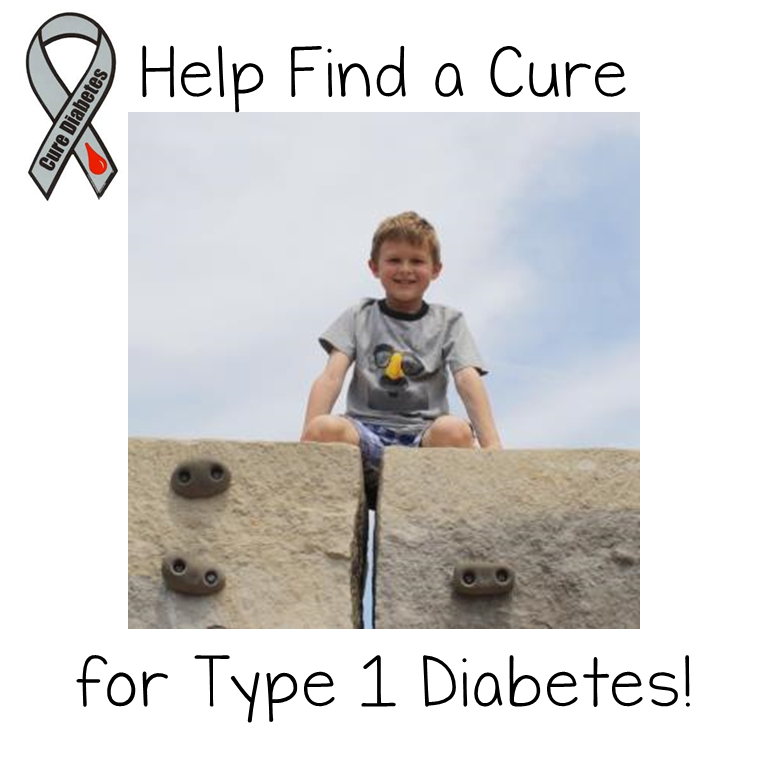 At the age of five, he was diagnosed with Type 1 Diabetes (T1D). I cannot even tell you what a scary and uncertain time this was for our whole family. There was a huge learning curve of insulin shots and blood sugar checks. Our son was such a trooper through all of this! He truly amazed me every day. Two an a half years later, he is doing well with managing his diabetes. He currently gets five shots of different types of insulin each day, and also checks his blood sugar throughout the day. We have to watch him very carefully so that we can help him notice if his blood sugar is dropping too low (hypoglycemia), or is becoming too high (hyperglycemia). Unfortunately, this is a lifelong disease that will not go away. Ever. There was a heartbreaking day for me when he asked me quietly, "How long am I going to have to do all of these pokes?" It absolutely broke my heart to tell him that he would have to do it forever. The Juvenile Diabetes Research Foundation is an absolutely fabulous organization whose mission it is to "Create a world without T1D." As the largest charitable supporter of T1D research,the JDRF is currently sponsoring $568 million in scientific research in 17 countries. In 2012 alone, JDRF provided more than $110 million to T1D research. To continue on with this research, there are many fundraising opportunities for people to help out. I am participating in my first half-marathon (Detroit Free Press International Half Marathon) in order to help raise funds and awareness for the JDRF. I am running in honor of my little guy and to help create a world where no mother will ever have to tell their five year old child that they have a lifetime of pokes to look forward to. I have done some typical fund raising type activities such as emailing friends and family, and having a donation sheet for people to donate, but I felt like I really wanted to do more. I wanted to raise awareness for this cause, and also try to break my fundraising goal of $750. 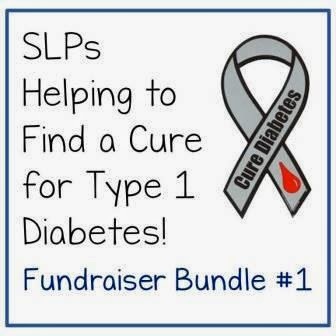 I decided to ask for some help with my fundraising from my wonderful SLP speech blogging family. Wow! They were absolutely incredible and generous! There are 32 SLP bloggers/ TpT sellers who have generously donated 36 awesome products for me to include in two bundles that are available to purchase. I will be donating 100% of the profits from these bundles to the JDRF. There are over $75 worth of products available in each bundle, and I am offering them for only $20 each! That is over 70% off in savings! You will be getting AWESOME sets of SLP supplies while helping out a great cause! There are a variety of articulation, language, and fluency products in these bundles. The bundles will be on sale at TpT from Friday, July 18 to Thursday, July 31, 2014 only! Thank you so much to everyone who has helped out with this fundraiser, and to everyone who purchases a bundle. I will update this post on August 1 to give you the final total of what will be donated to the JDRF. What a wonderful fundraiser. The bundles are such a bargain and you can't go wrong raising money for a great cause! God bless your family, especially that adorable little boy! Thank you so much, Jenn!!!! Jenn, you truly are the best! Thank you so much for your kind words and for your generous donation to the fundraiser! :) xoxo! Thank you so much Lisette! I so appreciate your generous donation to the fundraiser! My son was diagnosed three years ago next month at six years of age. It truly is a difficult journey; kudos for you for doing so much to raise money for our boys and others affected by T1D! Thanks to all who contributed as well. We need a cure! Beth, thank you so much for your purchases of the bundles! I pray that one day there WILL be a cure for both of our boys and all others affected by T1D! All of the contributors were overwhelmingly generous, and I will be forever grateful! Thank you so much for putting these bundles together. My husband was diagnosed with T1D when he was 7… and still each day is a struggle. It gets so frustrating hearing about T2D when T1D is of no fault to the diagnosed but gets very little attention. Best of luck and lots of prayers to your son and your family. It can be very frustrating that T1D does not get as much attention. People just don't know much about it. I have been told that I caused my son's diabetes, and am constantly asked, "should he have that to eat?" He can eat like a normal kid, he just needs insulin to cover it (I don't give him a ton of junk). Thank you for your kind words and support! All the best to you and your husband!